We are thoroughly enjoying our time in Peru so far. We spent a couple of days in Lima looking around the city and visiting Huaca Pucllana, an archeological site older than the Inca civilisation right in the city. We went to see a Peruvian dance show and got dragged up on stage! We flew over the Andes to the Amazon jungle where we trekked, saw wildlife and sweltered in the heat! After our jungle trip, we went to Cusco - which, at 3400m above sea level, is about as high as the height at which we skydived in New Zealand a couple of years back! We enjoyed wandering around this attractive old city and acclimatising to the altitude. We also travelled out to see the Inca ruins in the nearby Sacred Valley and visited an alpaca farm. The last few days have been our absolute highlight so far! 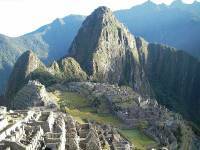 We trekked for 4 days along the Inca Trail to Machu Picchu. The scenery was spectacular and the sight of Machu Picchu at the end made all the pain worthwhile! We were lucky enough not to suffer too much from the altitude and really enjoyed the challenge of the trek. We are now back in Cusco and take the bus to Puno tomorrow.